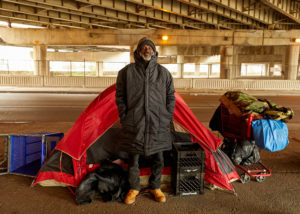 Chicago Coalition for the Homeless has a deep gratitude to our new friends at Spreetail for its generous offer to fund and distribute 160 ultra-durable winter coats to people living on the streets of Chicago. Chicago was the second stop on a 20 city tour for Spreetail, an e-commerce company with operations in six states and eight major cities. Giving back is central to Spreetail’s culture: They will be distributing 2,000 EMPWR Coats throughout the U.S. during the next two months. The EMPWR coats that Spreetail chose to purchase and distribute were made by the Empowerment Plan. The Detroit-based nonprofit that hires and trains single parents from shelters as seamstresses, thereby allowing them to earn a stable income, find secure housing, and ultimately regain their independence. The water-resistant garment can quickly transform into a sleeping bag or be used as an over-the-shoulder bag in warmer weather. Chad Kilpatrick and Clyde Johnson travelled all the way from Spreetail’s headquarters in Nebraska to spearhead the coat distribution. Erika George works with the Empowerment Plan in Detroit. She made the trip to Chicago to be a part of the distribution of the coats to persons living on the street. Ali speaks for all of us here at CCH when expressing his gratitude to both Spreetail and the Empowerment Plan for this opportunity.